After turning on your contact-based workflow and letting it run, you can analyze the performance of the workflow to measure its effectiveness. Click the name of your contact-based workflow. The Top metrics report shows the total number of contacts ever enrolled in the workflow, the number of active contacts in the workflow, and the goal conversion rate (Marketing Hub Professional and Enterprise only). The goal conversion rate is the number of enrolled contacts who met the workflow goal divided by the total number of contacts ever enrolled in the workflow. Only contacts who have been sent a marketing email in your workflow and meet the goal criteria will be counted toward the goal conversion rate. If a contact meets the goal criteria while active in the workflow, but hasn't been sent a marketing email in the workflow, they'll be unenrolled from the workflow but will not count towards the goal conversion rate. If a contact is manually unenrolled, on a suppression list, or removed by enrollment in another workflow, they will not count towards the goal conversion rate even if they meet the goal criteria at a later time. 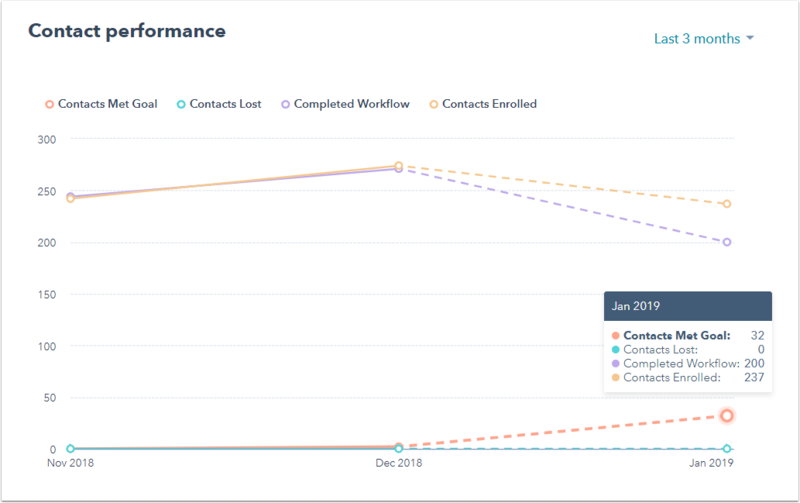 Contacts met goal: (Marketing Hub Professional and Enterprise only) the number of contacts who met the workflow goal(s) and were subsequently removed from the workflow. Contacts lost: the number of contacts who were manually unenrolled, on a suppression list, or removed by enrollment in another workflow. Completed workflow: the number of contacts who completed the final action in the workflow. Contacts enrolled: the number of contacts currently enrolled in the workflow. Hover over a data point in the chart to view a numerical breakdown of each metric. In the top right, click the dropdown menu to select a different time period. If any automated marketing emails were sent with a Send email action in the workflow, a number of email performance reports will be available. The Emails in workflow report shows all marketing emails sent in the workflow based on the percentage of contacts who were skipped, sent, delivered, opened, and clicked the email, as well as the overall performance of the email based on the average metrics of all marketing emails in your account. To sort the report by a specific metric, click the respective column header. In the top right, click the first dropdown menu to select a different time period, and click the View as dropdown menu to view raw counts instead of rates (percentages). The Emails delivered, Emails opened, and Emails clicked reports show a further breakdown of email deliveries, opens, and clicks in the selected time period. Hover over a data point in the chart to view the metric for each email. In the top right, click the first dropdown menu to select a different time period, and click the View as dropdown menu to view raw counts instead of rates (percentages). 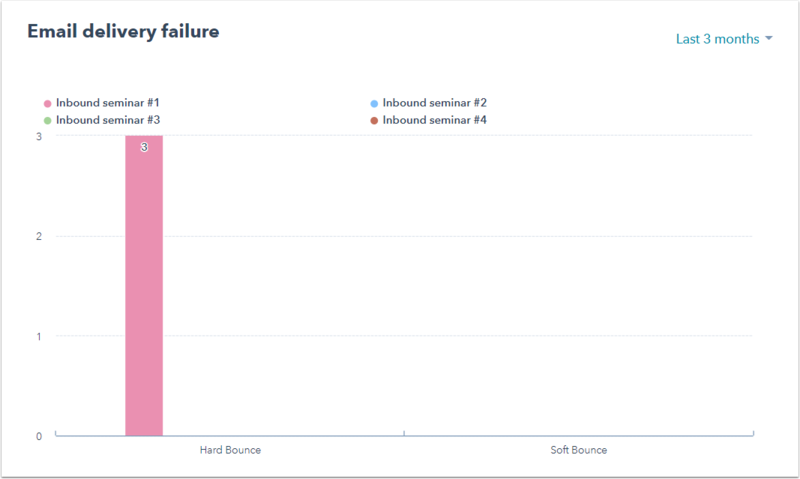 The Email delivery failure report shows the number of email deliveries that failed due to hard bounces or soft bounces. Hover over a bar in the graph to view a numerical breakdown of the metric by email. In the top right, click the dropdown menu to select a different time period. 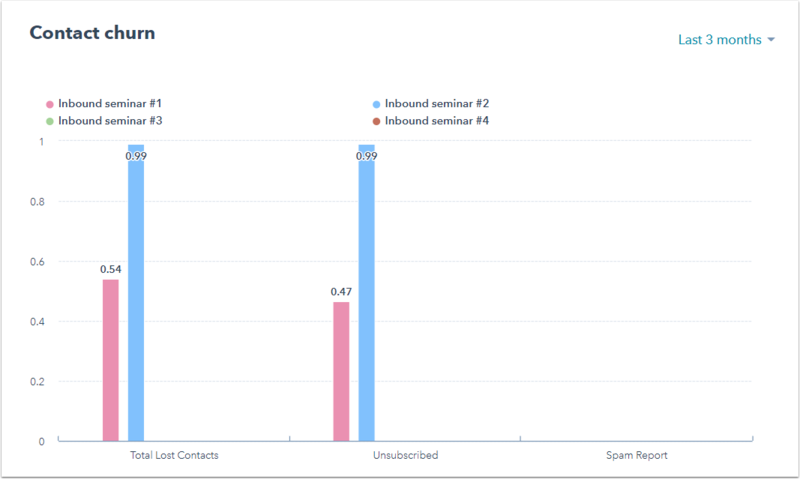 The Contact churn report shows the percentage of contacts that were lost by unsubscribing from an email or by marking an email as spam. Hover over a bar in the graph to view a numerical breakdown of the metric by email. In the top right, click the dropdown menu to select a different time period. 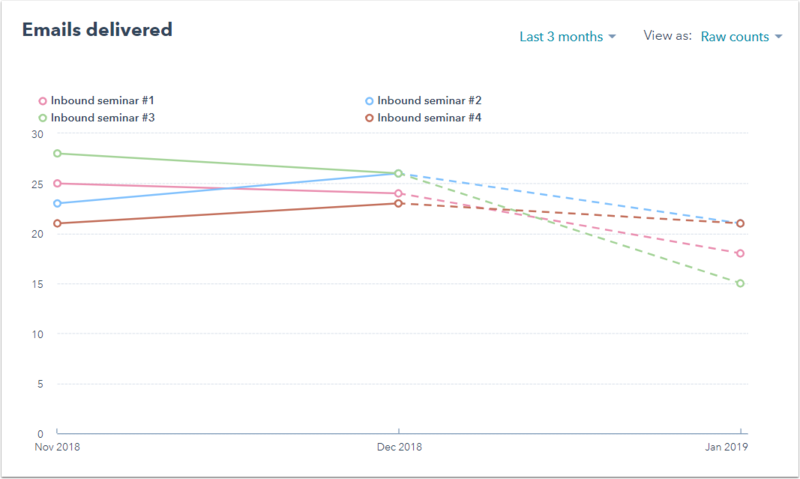 Learn how to define the job of a workflow and measure its performance on the HubSpot Marketing Blog.